I'm trying to stretch myself with poetry reading this year. The best way to attempt this is to use my current novel reading as a springboard into a poem. Whether it be an epigraph, a quote or a reference made within a book, I plan to no longer just read over these parts quickly. Instead I will stop, take note, find the whole poem and consider slowly and purposefully the poem within the context of the book. 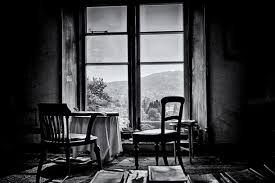 The image it created was very evocative and I appreciated how Gluck's general description of the room allows each reader to picture their own room, with the own chair, window and patterns of light. But it wasn't until I sourced and read the whole poem that I realised that Wright not only used a line from this poem for the chapter heading, but also for the title of the whole book. Further reading about Gluck revealed that she loves to reread Iris Murdoch "I love her wisdom and archness" (from Washington Square Review) and Franz Kafka. She was diagnosed with anorexia nervosa during her teen years and admired Joan of Arc as a child. She won the 1992 Pulitzer Prize for Poetry for her latest collection called The Wild Iris. I also learnt that an aubade is the opposite of a serenade, being a morning love song or a 'song from a door or window to a sleeping woman' (wikipedia). John Donne's poem, The Sunne Rising, is an example of an aubade. Aubade was first published in 1999 in Vita Nova. to fit in a brain. A room with a chair, a window. A small window, filled with the patterns light makes. the self at the center. grief I thought I couldn't survive. of light on the naked surfaces. of gold where the light struck. leaves of the copper beech tree. and I didn't know what the riches were made of. Oh, I love this and I am not even sure why. Evocative is the right word for it. There's something about time crying to be touched that moves me deeply. during your reading and investigate.